Here's an easy peanut butter cookie pie made with chocolate pudding and a layer of fudge. How easy is it? With only 25 minutes of prep, our Easy Peanut Butter Cookie Crust Pie is deliciously simple (and simply delicious)! Beat peanut butter, sugar and egg in large bowl with mixer until blended; press onto bottom and up side of 9-inch pie plate. Use back of fork to make cross-hatch design around edge. Bake 14 to 15 min. or until golden brown. Remove to wire rack; cool completely. Microwave 4 oz. chocolate, marshmallows and 1/4 cup milk in large microwaveable bowl on HIGH 1 min. or until chocolate and marshmallows are melted and mixture is smooth when stirred. Pour into crust. Refrigerate. Beat pudding mix and remaining milk with whisk 2 min. Stir in 1 cup Cool Whip; spoon over chocolate layer. Top with remaining Cool Whip. Refrigerate 2 hours or until firm. Draw 8 (2-inch-wide) stars on paper; place under sheet of waxed paper on baking sheet. Microwave remaining chocolate in microwaveable bowl 1 min. or until chocolate is melted, stirring after 30 sec. ; spoon into small resealable plastic bag. Press out excess air from bag; seal bag. Cut small piece (about 1/8 inch) from one bottom corner of bag. 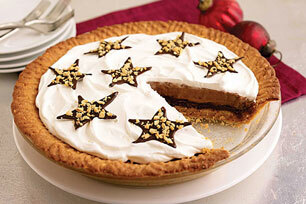 Use to pipe chocolate around outlines, then onto centres of stars; sprinkle with nuts. Refrigerate 10 min. or until firm. Carefully remove stars from waxed paper. Use to garnish pie just before serving. Prepare using Baker's Premium 70% Cacao Dark Chocolate.